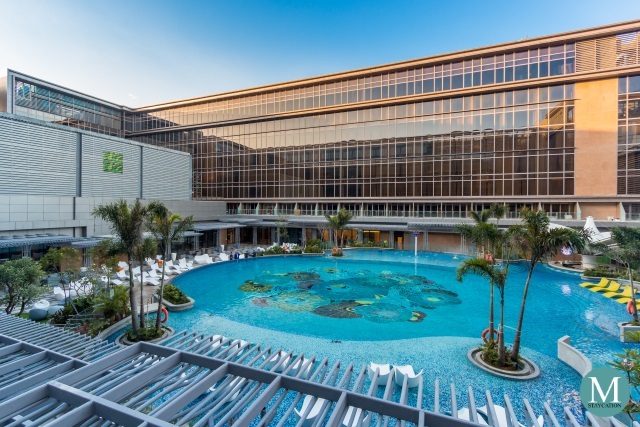 Shangri-La Hotel Kuala Lumpur guests staying in any of the Horizon Club rooms or suites, as well as Golden Circle Diamond members, enjoy a host of personalized service and exclusive benefits at the Horizon Club Lounge. The Horizon Club Lounge at Shangri-La Hotel Kuala Lumpur is one of the most elegantly designed and most spacious among all the Shangri-La Hotels & Resorts properties I have stayed in. There are plenty of seating areas to choose from which can accommodate solo guests, couples and big groups. The interior is bright and airy, with plenty of space to move around. I personally love the Malay-inspired wood carved panels in the lounge. The Horizon Club Lounge is open daily from 6:00am to 11:30pm, and any time of the day, guests are welcome to have their caffeine fix through hand crafted espresso beverages or a refreshing drink of chilled fruit juices or ice cold soda. 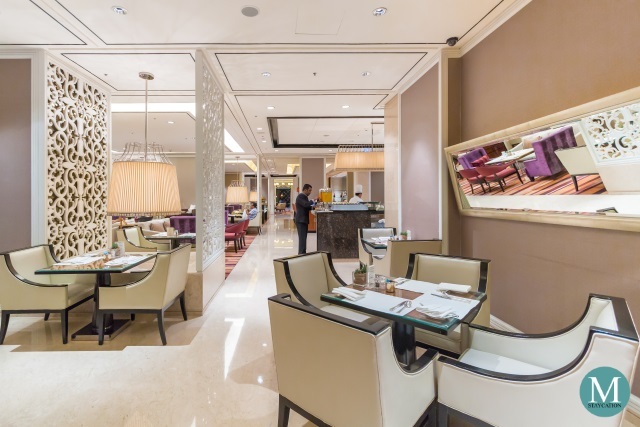 Afternoon tea runs from 3:00pm to 5:00pm daily, during which a variety of pastries, tea sandwiches and local delicacies are served to Horizon Club guests. Happy hour immediately commenced right after the afternoon tea service. During my stay, I started my afternoon tea quite late already at 4:30pm so I got to transition to evening cocktails after I finished my coffee and plate of pastries. 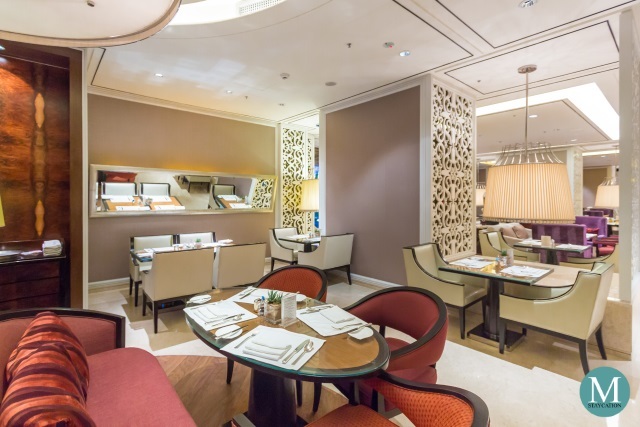 The Horizon Club Lounge at Shangri-La Hotel Kuala Lumpur has a wide selection of warm and cold dishes. The meat items were very filling and could already pass an early dinner. My favorites were the Malaysian Satay Chicken and the Turmeric Chicken Fritters. 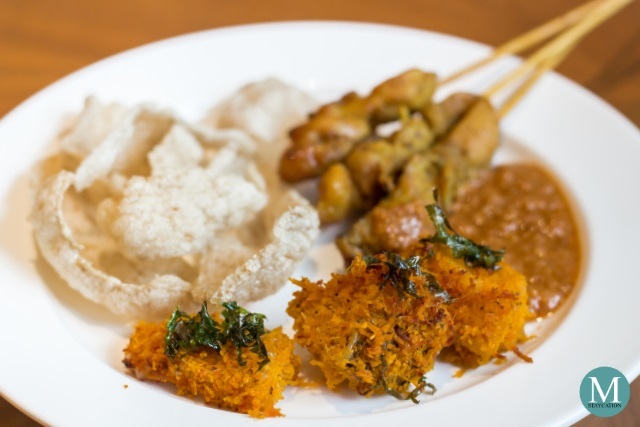 The krupuk (fried shrimp crackers) were also a good companion to the meat dishes. There is also a section for salads and fresh fruits. The food selection also includes continental items such as premium cheeses and cold cuts, as well as an impressive variety of tapas. In addition to wine and beer, guests can also make their own cocktails or have the lounge attendants prepare one for you one. Non-alcoholic drinks are also available. 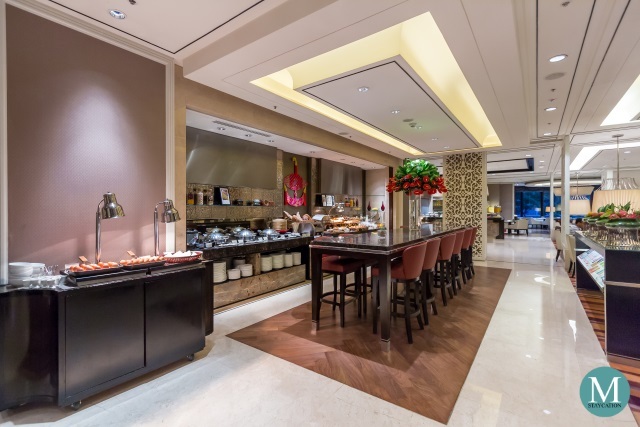 The breakfast at the Horizon Club Lounge is one of the things I look forward to when staying in a Shangri-La hotel. 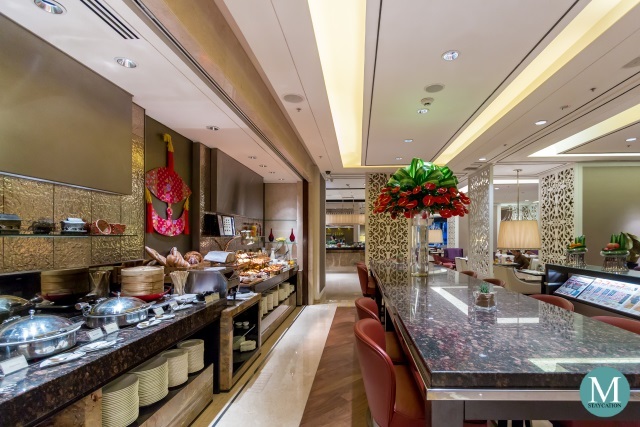 The Horizon Club Lounge of Shangri-La Hotel Kuala Lumpur has one of the most impressive buffet spreads I have seen so far. 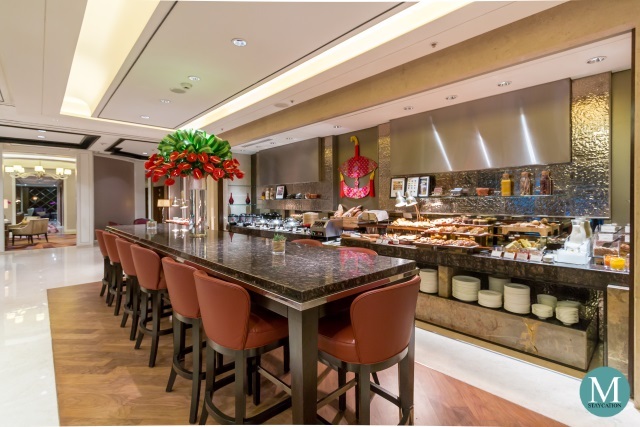 In addition to the continental items, there are freshly baked pastries, salads, cereals, dim sum, and a variety of hot dishes. 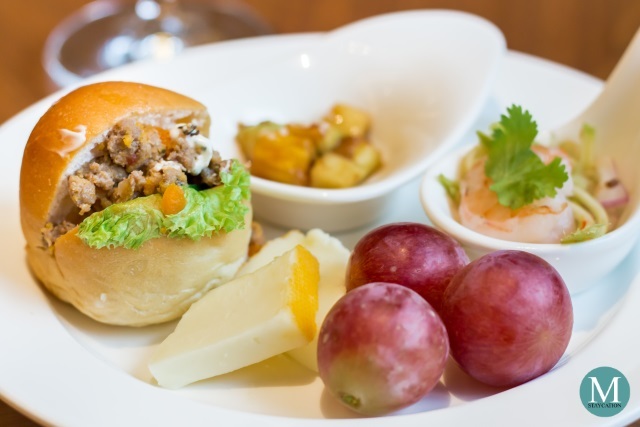 Horizon Club guests can also choose items from the a la carte breakfast menu. These are prepared a la minute, ensuring that dishes are freshly cooked and quality is maintained. 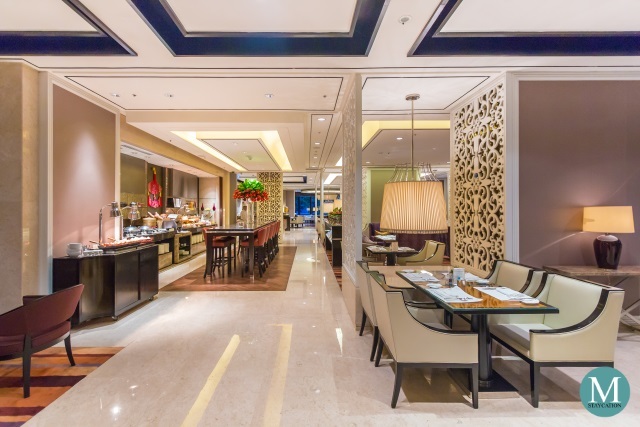 Guests can also order unlimited servings of the a la carte items which the lounge attendants will happily serve on your table. 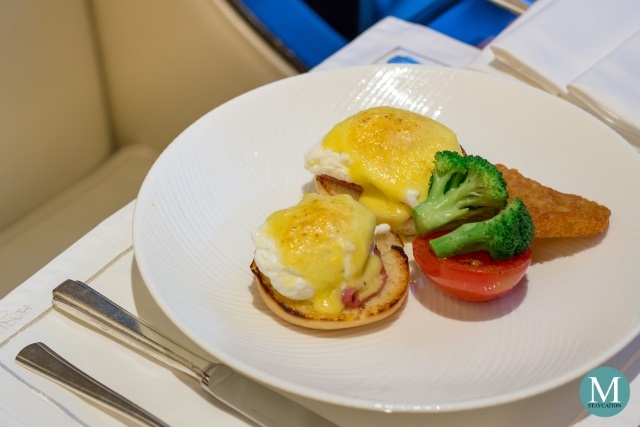 The a la carte breakfast menu includes a variety of egg dishes, including sunny side up eggs, scrambled eggs, poached eggs, hard or soft boiled eggs, whole egg omelettes, egg white omelettes, eggs florentine and eggs benedict. 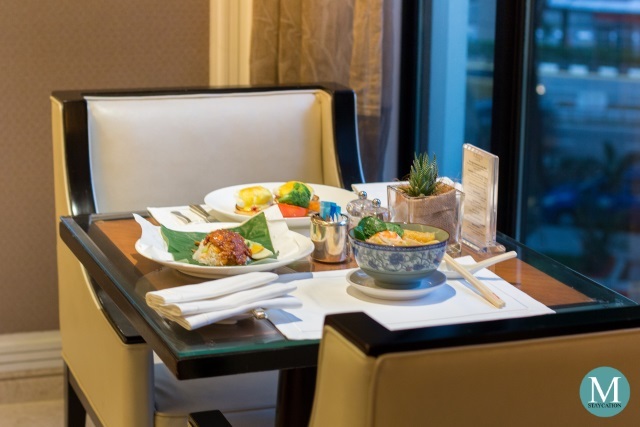 Having breakfast in a Shangri-La's Horizon Club Lounge also allows you to experience the local cuisine, which for me is one of the highlights of my travels. 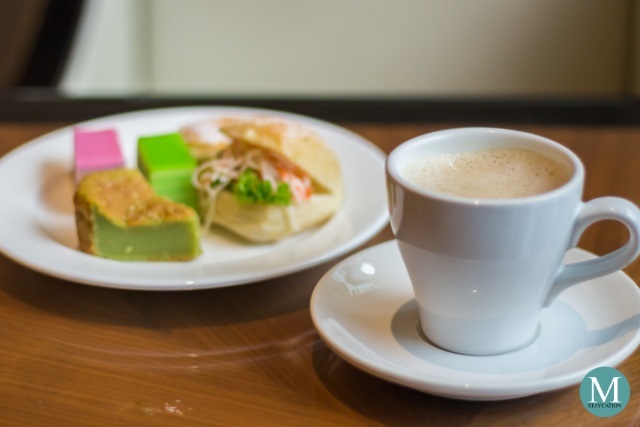 Here at Shangri-La Hotel Kuala Lumpur, they serve some of my favorite Malaysian breakfast items as part of the a la carte breakfast menu. 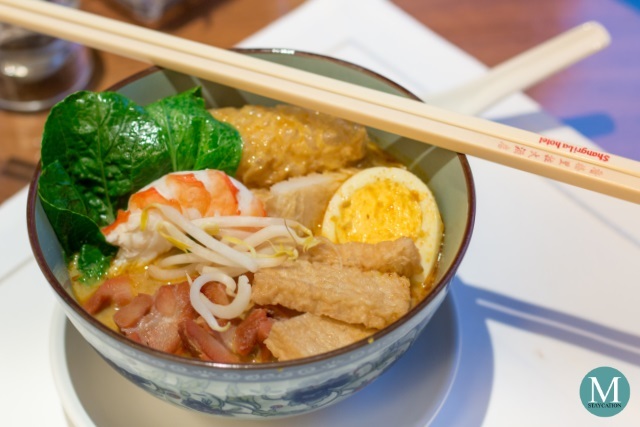 During my visit, I was able to try the Nyonya Laksa which is a noddle dish in a rich coconut curry broth an topped with fishcakes, prawns and chicken. 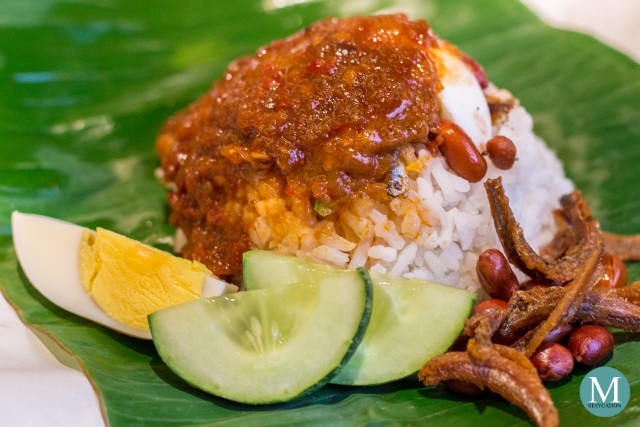 No breakfast in Malaysia is complete without the Nasi Lemak, consisting of fragrant rice cooked in coconut milk and served with dried anchovies, roasted peanuts, cucumber slices, hard boiled egg, and sambal sauce. Other local dishes from the menu are Roti Canai with Yellow Dhal Curry, Oat Porridge and their Signature Omelette Rendang. 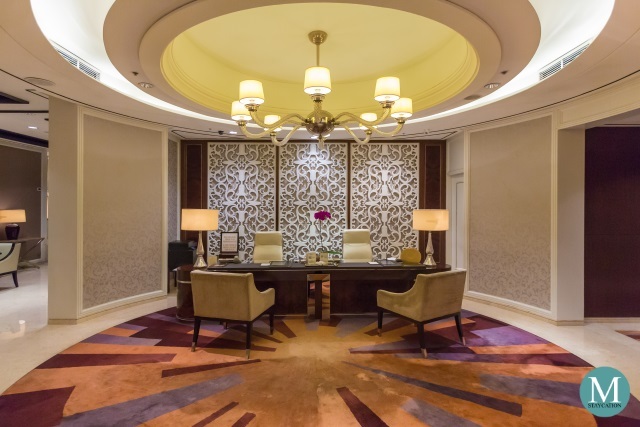 The Horizon Club Lounge is known around the world for its exemplary hospitality, and I have personally experienced this in various Shangri-La Hotels and Resorts locations. 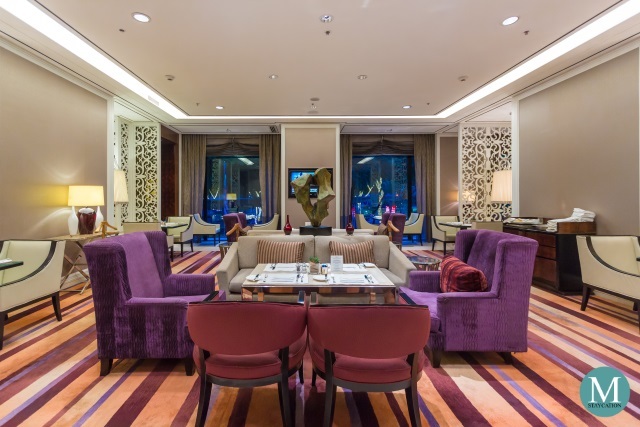 The level of service is very consistent, but I have to say that the Horizon Club Lounge Attendants here at Shangri-La Hotel Kuala Lumpur are some of the most attentive and hospitable. Ms. Yune Ahmad, the Service Manager of the Horizon Club, was such a sweetheart. She took good care of me during my whole stay at Shangri-La Hotel Kuala Lumpur, making sure that all my needs were attended, and would regularly check if every thing was in order. 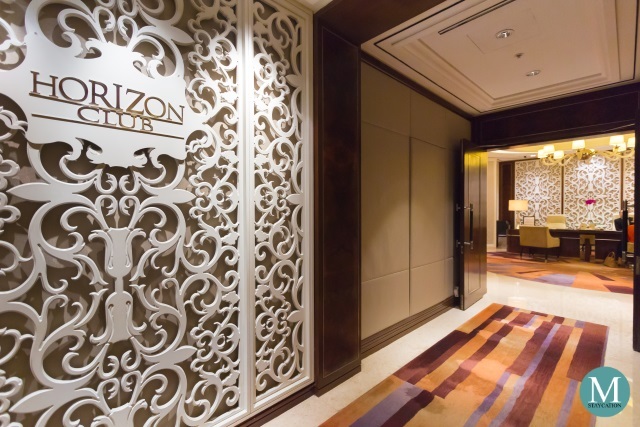 On my day of check-out, they let me hang-out at the Horizon Club Lounge and I was even offered to enjoy the afternoon tea until I was ready to depart for my evening flight back to Manila. I really appreciate their kindness. 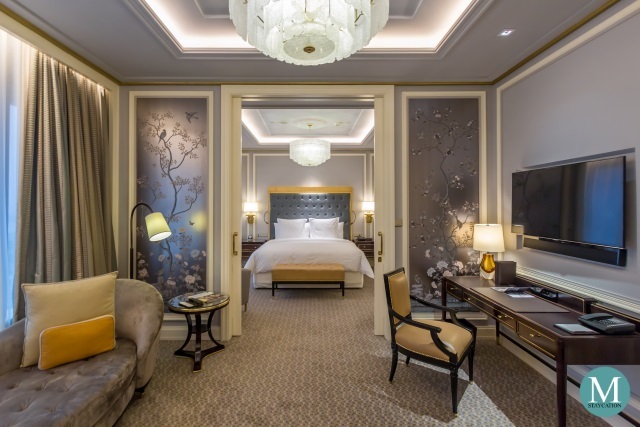 If you will be staying at Shangri-La Hotel Kuala Lumpur, I highly recommend that you book a Horizon Club room or a suite. 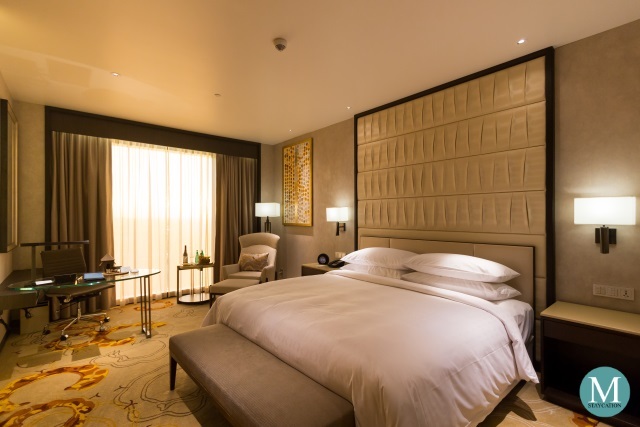 For a minimal premium you already get so much value in return, a big part of which will make your stay a very memorable one.